If you have a spare, why not share? Organ transplantation is an effective treatment for end-stage organ failure and is designed to give people a second chance at life. An exchange of organs from a donor to recipient is performed by transplant surgeons, during an operation under general anesthetic that can last for several hours. But none of this could be possible without donors. Global organ shortage is a poignant issue that can be surpassed by raising awareness and having conversations about organ donation on regular basis. There are two types of organ donors: living and deceased. While living donors can only donate a kidney, or a part of their liver, lung, and/or pancreas, a deceased donor can save up to 8-9 lives by donating major organs such as: heart, liver, lungs, pancreas, etc., as well as tissue. The most commonly performed surgery by transplant surgeons is a kidney exchange, both from living and deceased donors. The kidney is a paired organ (we have two in our bodies) and a donor can lead a normal lifestyle with only one kidney. During the organ matching process only medical (blood group, tissue type, medical urgency, etc.) and logistical (location) factors are used to ensure fairness and avoid any favoritism. You can read more about organ donation here. Practices of organ donation vary from country to country. However, the chronic illnesses, making people need an organ transplant, don’t abide by borders. Global shortage of organs has sparked a lot of unethical activities, involving organ trafficking, transplant tourism and transplant commercialism. Vulnerable people from less developed countries are exploited for their organs by affluent patients from high- and middle-income countries. Nowadays, all countries, except for one, have banned transplant commercialism (selling of organs from living donors). In 2008, The Declaration of Istanbul was created during the Istanbul Summit on Organ Trafficking and Transplant Tourism, supported by the International Society of Nephrology (ISN) and The Transplantation Society (TTS) While rules and laws vary across borders, most countries understand the need for organ donors and encourage their citizens to donate by raising awareness and starting conversations. Despite all the challenges, kidney transplant remains one of the most frequently performed transplantations worldwide. Kidney transplant is one of the three methods used for renal replacement therapy (RRT) and is the preferable treatment for End Stage Kidney Disease (ESKD). As the issue of organ shortage imposes considerable limitations on the number of accessible treatments, governments and hospitals are working hard to attempt to shorten waiting lists for patients. One of the solutions is paired donations, also known as Kidney Paired Donation (KPD). KPD is used where a potential donor is incompatible. Imagine a situation where a wife urgently needs a lifesaving kidney transplant, her husband is happy to donate on of his kidneys to her, but they are not a match (the antibodies in their blood are incompatible and would mean a rejection of the transplanted organ). Instead of the wife missing out on her chance to survive, they are matched to another pair in the same situation and the husband donates his kidney to another person, while the wife receives a transplant from another person. While not always possible, a kidney transplant remains the most cost- and result-efficient procedure for saving lives of people with failing organs. 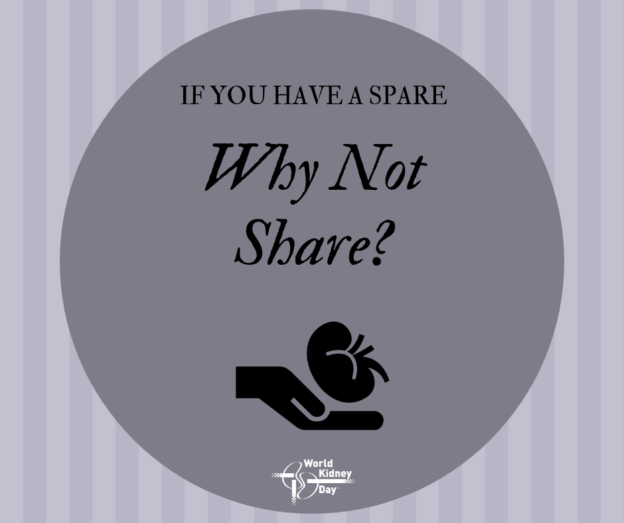 Have a spare, why not share? To find out more about organ donation in your country, please talk to your local hospital or healthcare provider.